So today my AP Gothic Lit. class is taking a test on Frankenstein, and in honor of this I’m posting about something adorable and tasty. This week’s Fashion Friday post comes to us from guest blog contributor Dana. Thank you, Dana! Another reminder: Monday is the 13th of the month, so all you rêveurs and rêveuses, reveal yourselves! Hi, everybody. When Angélique asked if I would do a Fashion Friday guest post, I thought, Sure, I can do that. I’ve been pondering what to write, and it’s changed several times. What I’ve finally settled on is this: I love fashion and I love girly stuff, especially jewelry. I always check all of the red carpet photo galleries and rarely miss a “What Were They Thinking?” fashion post. But for me, on a day-to-day basis, being a girl is more fun in theory than in practice. The subject came up regarding Angélique’s fashionable and fabulous hats. When she mentioned the first hat making party, it brought back some fun memories. I still have the hat I made at that party. I still think it’s rather lovely. There are flowers and lace and more flowers and pearls and silk and a lovely long scarf hanging down the back. 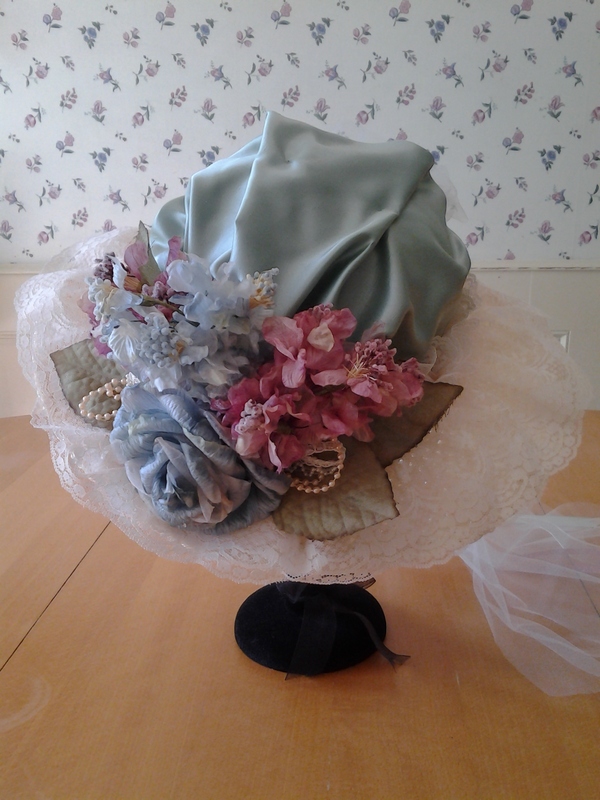 This is the first hat I ever made. I’ve also never worn it. Partially because it’s too big and partially because, well, it’s a lot of work to get dressed up fancy enough for it. (And I’ve yet to go to Tea in a season for which it’s appropriate.) 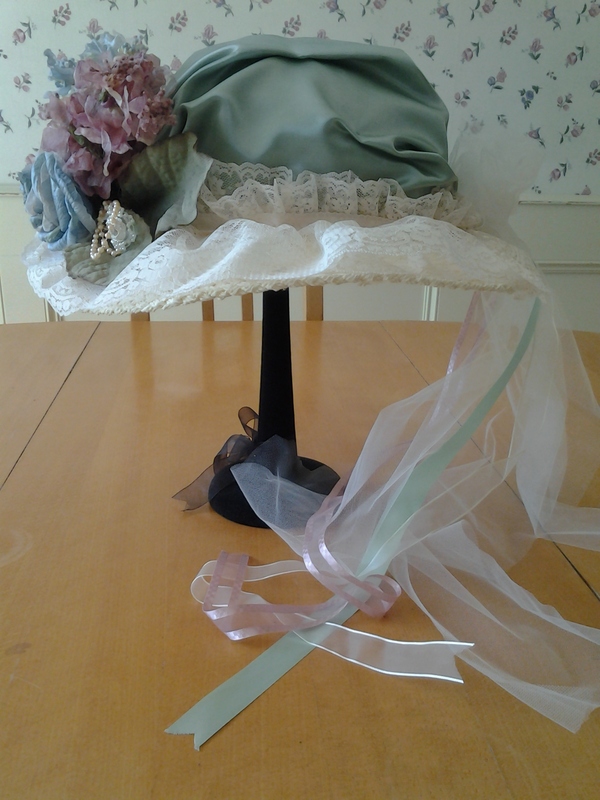 I think it’s a lovely hat but when it comes down to it, it’s just a little too frou-frou for me now. At the time, probably not so much. Back then I wore make-up regularly and bought more stylish clothes and worked hard to keep up a certain appearance. These days comfort is more important. This was true even before my darling daughter was born. This will end up being the most girly thing I ever make in my life. Cute, isn’t she? On a day-to-day basis, I’d rather wear Birkenstocks than Blahniks, jeans or shorts instead of fancy skirts or trousers, and cotton over linen and silk. And you know what? That’s totally okay. At 41 I can admit that I love fashion and fancy, girly stuff but feel no need to wear it. I’m finally comfortable enough in my own skin to wear what feels good and not worry what people think. And I think confidence is the best accessory of all. Would you like to be a guest blogger for Fashion Fridays? Check out the main FF page; guidelines for how to submit are listed there. I just love the way all these blooms came together! From this side angle, you can see the long ribbon and tulle train. …because it’s a gorgeous late-March day in Texas, the flowers in my garden are blooming like their lives depend on it — and they do, because the more beautiful they are, the more I make time for them (sad but true) — and this weekend it is time to rotate my fall and winter clothes back to the armoire in the office to make way for my spring and summer wardrobe. 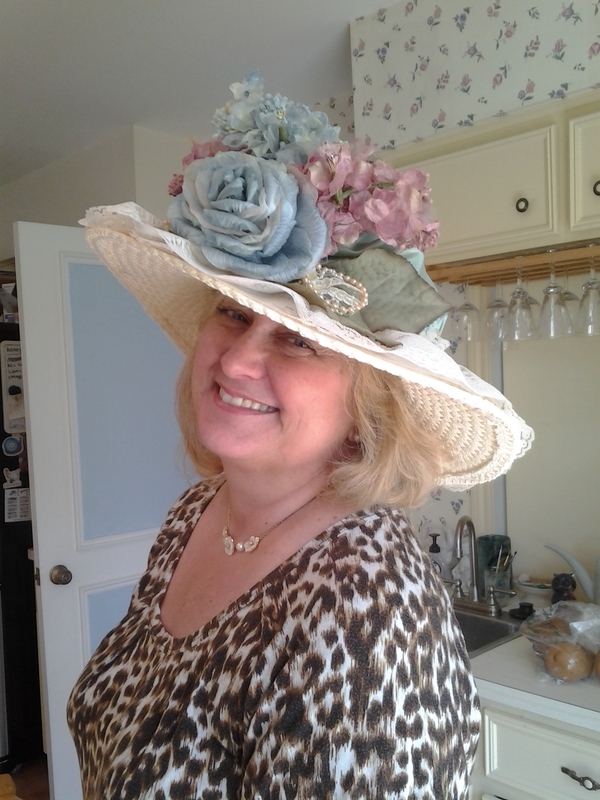 My lovely friend Elani graciously agreed to model the hat for me when she came over today to help me roll grapeleaves (Lebanese style) for Easter. I made this hat at a party where a bunch of my girlfriends all came over and made hats. We then wore our hats out to tea at a fancy hotel. We called ourselves The Hat Ladies. Maybe some day I will tell you that story, too.